Gabe Richmond’s art show “In A New Light” will be at the Artisan Shoppe & Studio through the first part of February. Pictured is Richmond with some of his art pieces. 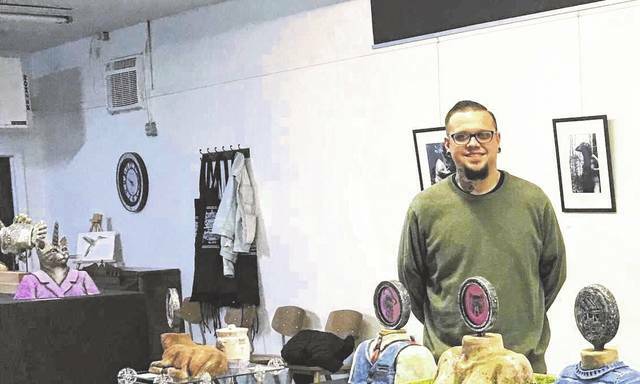 GALLIPOLIS — Acceptance of self and acceptance of others is at the heart of Gabe Richmond’s art show “In a New Light” which is now on display at the Artisan Shoppe & Studio in Gallipolis. Richmond has a long history of putting his artistic talents to professional use. He started hanging out in his father’s tattoo shop when he was a child and was professionally tattooing by the age of seventeen. After high school, he continued tattooing, but as his family grew, he found it more difficult to tattoo full-time due to the seasonality of the business. In order to supplement his income, he worked various jobs and tattooed when he could to maintain a steady income that provided for his family. Eventually, Richmond began looking for ways he could make a living as a full-time artist. Enter the art program at the University of Rio Grande. Richmond, with the full support of his family, applied, was accepted and started in the program in 2014. Originally, he had considered pursuing a teaching degree in art but was told his tattoos may prevent him from getting a job in the area. So, he switched to general fine arts, with the ultimate goal of obtaining his master’s degree in the future. Richmond faced a lot of judgment from others while he was growing up and it was those hardships that worked their way into his art. Whether it is the two-sided sculptures, featuring tattooed faces with contrasting inscriptions, like a woman’s face with the word harlot on one side and daughter on the other, or the use of mixing animal and human features, Richmond’s body of work is an artistic commentary on the judgements of others and hiding oneself for fear of those judgements. Tattooing the faces also holds its own commentary, as often face tattoos are viewed as the most taboo of tattoos. Specifically, with his photography, which often depicts people wearing animal masks in a wooded setting, Richmond said it’s almost like he is presenting them in a way that they have a hidden strength. He’s always been fascinated with supernatural beings like shapeshifters and werewolves for that very reason. Much of that fascination has worked its way into his artwork. “By mixing the animals and the people together, I feel like I’m creating a world where people can truly, authentically be themselves,” said Richmond. Some of Richmond’s newest pieces, which are on display, include a new use of decals on his works. For instance, one of his sculptures “As We Grow” depicts flowers that appear to be growing on the sculpture of a woman’s chest to symbolize growing into the person you want to be. Above the chest are mirrored images of a bear face and a fox face. “I really want people to look at other people from different angles. The majority of my work deals with the relationship between the fear of whether or not you’re going to be accepted for who you are. For instance, I feel like a lot of people are afraid to present themselves how they really want to present themselves. Or they’re afraid to come out and do things that they fear will not be accepted by other people,” said Richmond. Through his pursuit of art, Richmond said he feels the wall he’d built up in his youth being taken down brick-by-brick and hopes his works have the same impact on others. In addition to a budding art career, Richmond still tattoos full-time at Temple Tattoo in Gallipolis. He recently applied to multiple art schools and is awaiting replies. Until then, he plans to continue making art and pushing himself to try new styles. “In A New Light” is on display now and scheduled to remain on display through the first part of February. The Artisan Shoppe and Studio is located at 749 Third Avenue, Gallipolis. Visit them on Facebook for hours and contact information. https://www.mydailytribune.com/wp-content/uploads/sites/42/2019/01/web1_1.30-Richmond-2.jpgGabe Richmond’s art show “In A New Light” will be at the Artisan Shoppe & Studio through the first part of February. Pictured is Richmond with some of his art pieces.